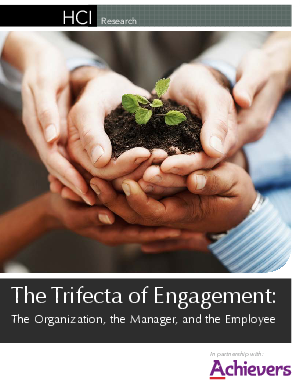 What makes up the trifecta of employee engagement? It takes your senior leaders, the manager and the employee all collectively working together to drive engagement within an organization. The Human Capital Institute (HCI) and Achievers recently wrote a research report exploring how these three key elements work together to increase performance, dedication and productivity in a workforce. Employees can show their support to engagement efforts.